Fall is officially here. There's a nip in the air and the leaves are changing colors. Well not here in Florida, but in several other states across the country, the Fall season is almost here! As I continue on my hair journey I'm learning that a change in the seasons usually leads to a change in my relaxed hair regimen. The reason for this is my hair reacts differently to colder temps than it does warmer ones. As well as to less or more humidity in the air. With these different reactions come the need for different hair products to counteract them. Since I'm now living in Florida I probably won't need to change much in my relaxed hair regimen, but I do have some thoughts and tips based on past years of living in North Carolina that I can share. In the fall the air gets drier which can also dry out chemically-treated and natural hair strands, especially the ends which are the older part of hair strands. This makes moisture based products or treatments even more valuable. Weekly deep conditioning treatments. If you weren't doing this during the summer, the fall is a great time to start. If you already were, continue doing so. Believe me, your hair will thank you. Hot oil treatments. Doing these can help with correcting the moisture balance in hair. They also help with softening and nourishing the hair. Your hair will also thank you for this. Moisturizing and sealing more often. You may find that while you moisturized and sealed a couple of times a week during the summer your needs it several times a week in the fall. If you use lighter oils in the warmer temps, you may want to consider using switching to heavier oils in the cooler temps. This results in more moisture retention because the heavier oils can better withstand the cooler air. Coconut oil is a popular oil for hair care, but it solidifies in cooler temperatures that are 75 degrees and below. Something you don't want to happen when it's on your hair. So, if you use coconut oil or other oils that solidify, this a good time to either use them up quickly before the temperatures drop or only use them in hot oil treatments. When the weather gets cooler, I like to use sunflower oil because it's not too light and not too thick. Another oil I use is Jamaican Black Castor Oil. I use it in hot oil treatments, on my scalp and to seal my ends. By wearing more styles that keep the ends tucked away you can keep that moisture from your hot oil treatments and deep conditioning from easily escaping. It will also protect your ends from rubbing on the rough materials of your scarfs and sweaters which can cause split ends. 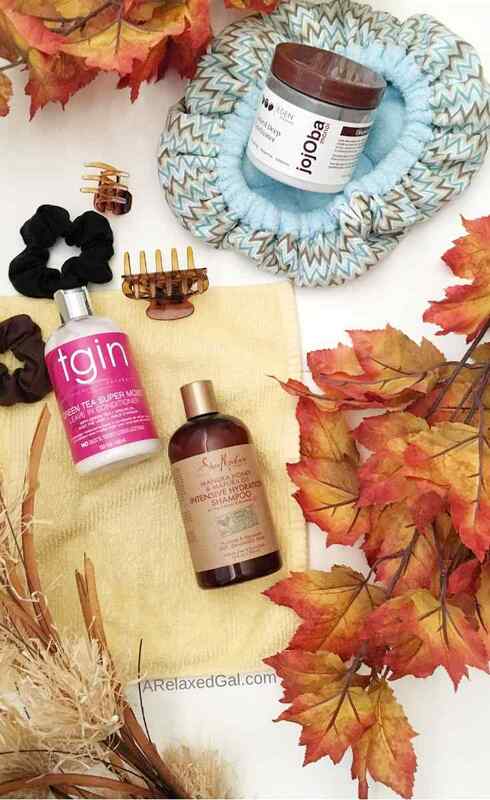 What are your tips for a fall hair regimen? I'm definitely all about protecting my ends this fall! Funny thing is I haven't been doing as much to protect my ends this fall as I did last year. I've decided to enjoy my hair more and have been wearing it down. So far I haven't seen any adverse effects. Hoping that continues. Leah, these tips are so insightful. After long days or an end to the extended work week, I rarely put the time I need in my own hair. You have brought to light a solid weekly and biweekly routine even during the different seasons. I have gone to the same stylist forever and didn't take much time on my own to care in the level you discuss for my own hair. Moisturizing and sealing are two things I'm going to focus more on at this time. Thank you for your research-backed tips. I love your suggestions. Thanks for reading! I'm glad you've been able to find some helpful information here. Good luck as you embark on a healthy hair journey.